When you see something that received high praise when it first appeared, it can disappoint you. If it was the peak of high craftsmanship in its time, later works may have come along to outshine it and make it look ordinary. If it was fresh and barrier-breaking, later works may have gone beyond it, making it look fusty. 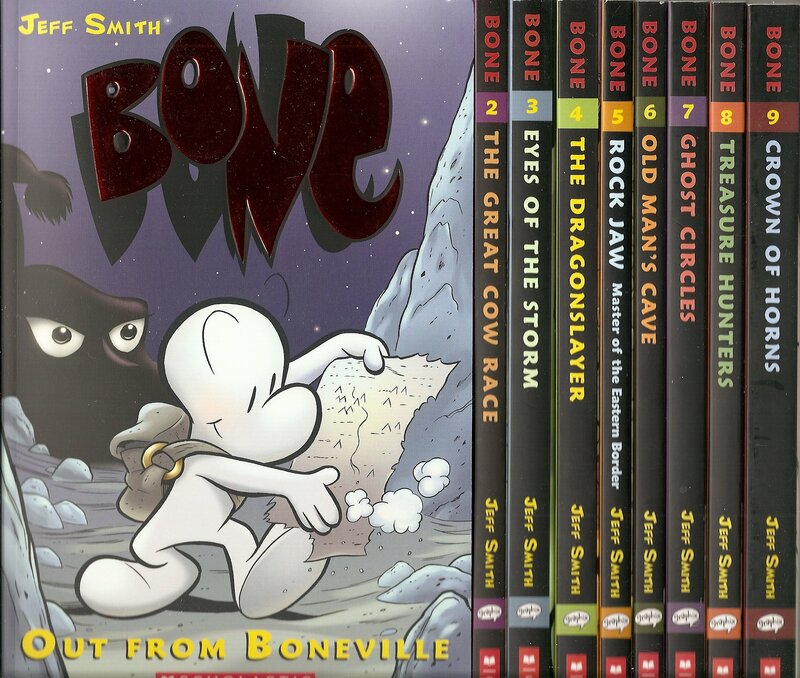 I’ve been reading BONE by Jeff Smith, which first appeared in 1991. And . . .
It’s terrific. The writing is funny and suspenseful and full of heart, and the art is expressive and beautiful. If Smith were bringing BONE out as a new work today, it would get the same spectacular praise as it got the first time around. I liked BONE well enough when it first appeared, but I didn’t read all of it. Now, I’m re-reading the parts that I already knew as well as parts that I’ve never read, so I have two perspectives on the work. Both of my perspectives agree: It’s terrific. Jeff Smith has been concentrating on picture books lately and doing them beautifully, as you’d expect. But Jeff, please — come back to comics. I recently finished P.J. O’Rourke’s Parliament of Whores, which I recommend. Though the book is more than 25 years old, and O’Rourke is as conservative as I am liberal, which is a lot, I found it hilarious over and over. A lot of the appeal is O’Rourke’s honesty. • He despises government but can’t stop noticing that a lot of people who comprise it are likeable, sincere, and hard-working. • He makes fun of people who petition the government for a redress of grievances but admits that he’d impose his own desires and quirks on the political system if he had half a chance. And unlike a lot of political grumblers, he goes on the scene — in Washington or in a war zone — to look into what he’s griping about. My fellow animation fans, you’ll like this. Sirius XM’s Classic Radio channel is running a theme of “Christmas in July,” airing Christmas-themed shows. Today, they broadcast a 1949 version of It’s a Wonderful Life, starring Jimmy Stewart as George Bailey, the role that he played in the movie. For the guardian angel Clarence, the producers didn’t get Henry Travers, who played him in the movie. Instead, they hired . . . I am not kidding. Arthur Q. Bryan, the voice of Elmer Fudd, played Clarence in the voice of Fudd. Maybe it was Bryan’s natural voice; I don’t know. But it’s weird as hell to hear Elmer Fudd introduce himself, as Clawence, to George Baiwey of Bedford Fawws. I just finished one of the most enjoyable Superman, Batman, Wonder Woman stories that I’ve read in quite a while. Since last summer, Scholastic has published graphic novels under the series title “Secret Hero Society,” featuring the young (about age nine or ten) Bruce Wayne, Clark Kent, and Diana of Themyscira. In this first one, Study Hall of Justice, the youngsters meet at Ducard Academy, a school whose staff includes Hugo Strange (guidance counselor), Thaddeus B. Sivana (science), Vandal Savage (history), Solomon Grundy (homeroom) and Coach Zod. Bruce, Clark and Diana’s classmates include the young Lex Luthor, “Joe Kerr,” Bane, Giganta, and other nasties. Bruce believes that something troublesome is going on at Ducard. To help him investigate, he recruits his new friends Clark and Diana, even though he doesn’t trust them completely. The story by Derek Fridolfs presents the characters deftly and moves swiftly — a little too swiftly toward the end, which feels rushed. Dustin Nguyen’s black-and-white art is lively and vivid, if a bit too sketchy to help me understand who’s who in some panels. Sadly, I probably would never have seen this book except by luck: I ran across it at my library’s Friends of the Library bookstore for donated or discarded books. But it’s a lot of fun, and I recommend it. As I mentioned in part one and part two of this series, I love errors. As an editor, it’s my job to find them, and I’ve had a merry time so far picking on my colleagues in journalism and advertising. Now, let’s aim the lens at our friends in public service. As the top line says, it’s your tax dallors at work. 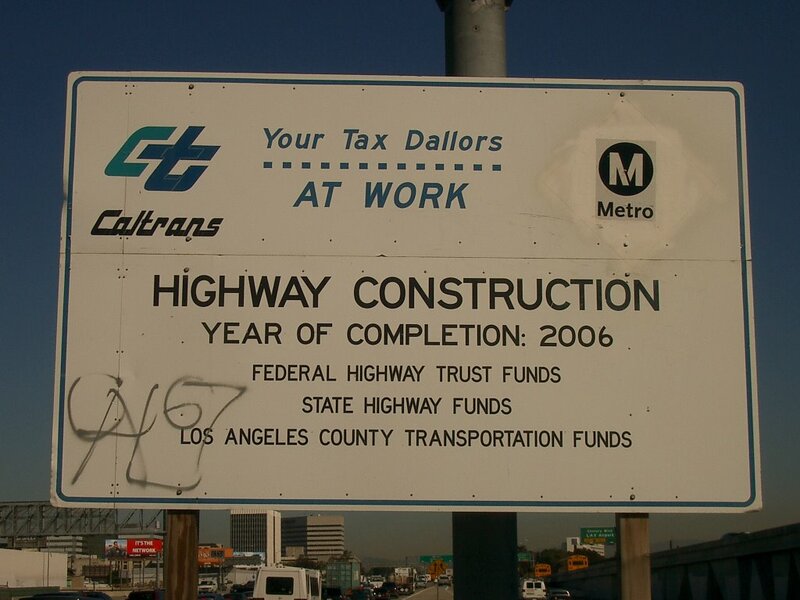 Los Angeles County must be very frugal with its citizens’ money; it won’t even pony up enough for a dictionary. The next one is so blatant that you’d swear it’s fake – but it’s absolutely real. The people who made the mistake should have studied harder in that place where people go to learn spelling. You know the place . . .
SOTP and SHCOOL are only paint, so they’re easy to fix. But some errors get embedded in more permanent media. San Francisco presses its street names into concrete. Unfortunately, the city doesn’t always get its own streets right. Not all errors get enshrined on the streets. Down in Chile, the officials of the national mint created a new coin – but never noticed that the coin misspelled the country’s name. Top officials at Chile’s (or Chiie’s) mint lost their jobs over that one. And that, boys and girls, is why we all need editors. Continuing our series on the mistakes that require an act of God or a sharp-eyed editors to prevent: Advertising and marketing have their own trips, falls and spills. The fleece garments in the ad below are so pleasing to touch and feel that one of the ad’s models needs more than two hands. For some reason, ads run into a lot of misspellings. Oklahoma State University “offers the highest excellence” in . . . well, take a look. Of all the words for a school to mess up . . .
Grey’s slogan is “Famously effective.” This mistake was so blatant that some observers wondered if Grey made it on purpose just to get attention. Then there’s this little number from a prominent department store. By now, you’ve sharpened your eyes to spot these goodies – so let’s play Find the Typo! Take a look and see if you can find the wild one in this box cover. Check out the second line from the bottom, about “always upholding the highest standards for every detal.” Man, those pesky detals . . . . Lest you think that I’m picking on the private sector, fear not. The next and final episode of our little adventure focuses on the messes that come from the faithful public servants in government. I’ve never been a fan of traditional “guy stuff” — pro football, war movies, that sort of thing — partly because it doesn’t usually involve a lot of women. As a guy of the hetero persuasion, I like looking at women, being around them and doing stuff with them. I just don’t feel the appeal of activities where women are only marginally involved. I know, of course, that a lot of women enjoy traditional guy stuff. Fine by me; each to his or own pleasure. But watching guys collide with each other or kill each other? I’d rather watch The Women (the great 1939 version) or Pitch Perfect or the new Ghostbusters. I know that a lot of people have hated the new Ghostbusters trailers. Even Melissa McCarthy, one of the movie’s stars, has admitted that the first trailer wasn’t all that good. But a one-after-another viewing of the second trailer and the original Murray-Aykroyd-Landis movie’s trailer provides an interesting contrast. The original has a much more “serious,” mock-menacing tone, which contrasted with the trailer’s gags and highlighted them. Also, the original doesn’t include Ernie Hudson’s character much at all, while second new-GB trailer gives time to all of the ’busters. Another difference, a big one, is Bill Murray’s sublime confidence. The stars of the new movie are funny, but none of them displays Murray’s apparent ease and panache. Comedies don’t always need that kind of style, but it sure did buoy the original movie. Bottom line, though, is that both the original and the second “new Ghostbusters” trailer have a few good laughs. So despite all of the hatred and controversy over the new trailers, I think that the new movie has a good chance to be really funny. And in any case, we’ll find out sooner or later, won’t we? Finally saw Zootopia. A good movie, but as it went on, I found myself getting less and less delighted with it, and I couldn’t figure out why. Now, I think I have it. The movie is a whodunnit that takes place in fascinating neighborhoods full of interesting characters. But as it unreels, it concentrates less on exploring the neighborhoods and the characters, and more on solving the whodunnit and stopping/catching the villain. So as the story goes on, the movie starts under-using some of its most appealing elements. I’m not saying that a whodunnit can’t work in animation. The standard for that sort of thing is Who Framed Roger Rabbit. But as Roger goes on, it keeps revealing more and more about its characters and milieus (milieux?). In scene after scene, Roger offers the audience new discoveries, while Zootopia starts to level off after a while. Fortunately, Zootopia never plateaus completely, which is one reason why it’s a good movie. Despite its flaws, I’d be happy to see it again.